Regardless of how you feel about the outcome, Tuesday's General Election was settled thanks to the more than 100 million people who exercised their right to vote. Now, on Friday, November 11th, America will celebrate Veterans Day by honoring the brave men and women who have sacrificed everything to protect that critical right, along with the other rights we enjoy every day. As with previous years, several restaurants across the country are saluting veterans and active duty military with exclusive deals for free burritos, pizzas, coffee, and family-size portions of Chicken Parmigiana. Because they deserve a nice free meal, and much more. The deal: Get a free burrito, burrito bowl, order of tacos, or salad with the purchase of any entree and valid active military or veteran ID. When: From 3pm to close (local time). The deal: As part of Starbucks' way of saying thank you, veterans, active duty military, and their spouses will get a free tall coffee. The deal: Show your valid military ID (or other proof of military service), and the cheddar bay biscuit purveyor will treat you to one free appetizer or dessert. The deal: Show up in your uniform or provide other proof of your military service, and California Pizza Kitchen locations nationwide will serve you any entree from this special Veterans Day menu for free. The deal: America's family-style Italian chain is offering veterans and military service members one free entree from this list of six options. The deal: All active duty military and veterans can choose one free meal from the chain's special menu. The deal: The fast food fortress is treating veterans and other military service members to a free Breakfast Combo or a free Castle Combo Meal (#1-6), and best of all, you don't have to buy anything. The deal: As with previous years, Outback will serve you a free Bloomin' Onion and a free Coca-Cola drink, when you show valid military ID (more specifics here). The deal: If you're among the nation's active, inactive, and retired military personnel, you can hit up your local Denny's for a free Build Your Own Grand Slam (if you show your valid military ID), according to a press release. The deal: Chili's is honoring America's finest with select free entrees at participating locations nationwide. The deal: This year, the International House of Pancakes will serve you a fluffy, patriotic stack of its Red, White & Blue Pancakes. Some locations will even throw in a combo with two eggs, hash browns and a choice of two bacon strips or pork sausage links. 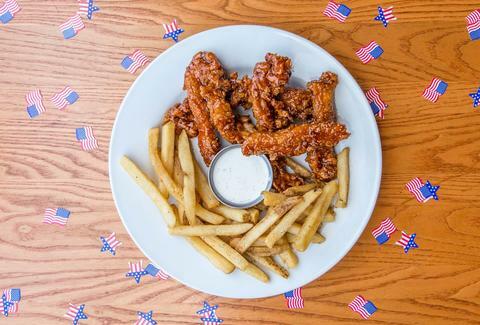 The deal: You know the drill -- show your military ID and Hooter's will serve you a free entree from its Veterans Day Menu as a thank you for your service. The deal: Show any proof of military service and you'll get a free Red’s Tavern Double Burger and Bottomless Steak Fries. The deal: Present your valid military ID and you'll get an Angus Beef Top Sirloin Steak, served with home-style mashed potatoes, broccoli with garlic butter, and Sweet Molasses Bread at any of the restaurant chain's 46 locations, according to a spokesperson. The deal: Buy any side or drink and this burger chain will give you a free Wayback Classic Cheeseburger at participating restaurants nationwide, when you dine-in while in uniform or show your military ID, according to a press release. The deal: Veterans and military service members can grab a free All-American Burger with proof of military service at participating locations while supplies last, according to a press release. The deal: Just like last year, the chain of country stores/restaurants will provide veterans with a free slice of its Double Chocolate Fudge Coca-Cola Cake. The deal: Veterans and active military get one free appetizer -- and you don't have to buy anything. The deal: As with previous years, veterans as well as active or former military service members will receive a free meal from the chain's special lunch menu with proof of military service. The deal: Just present your military ID and you'll get a free order of Bang Bang Shrimp. The deal: Get a free small order of traditional or boneless wings and a side of fries with proof of military service. The deal: To honor those who have served, this chain is offering veterans and active military a free breakfast, lunch, or dinner with proof of military service. The deal: Get a free appetizer or dessert plus 10% off your table's check. The deal: Veterans and active duty service members get a free lunch up to $12. The deal: Pick up a free $5 Hot-N-Ready lunch combo, which includes four slices of its DEEP! DEEP! pizza and a 20oz Pepsi drink. The deal: Veterans and active military can pick one of six free meals from a special menu. The deal: This Veterans Day, the restaurant and brewhouse chain will serve you one free entree under $12.95. Tony Merevick is Cities News Editor at Thrillist and thinks veterans and active military deserve way more than just free food, but it's a start. Send news tips to news@thrillist.com and follow him on Twitter @tonymerevick.